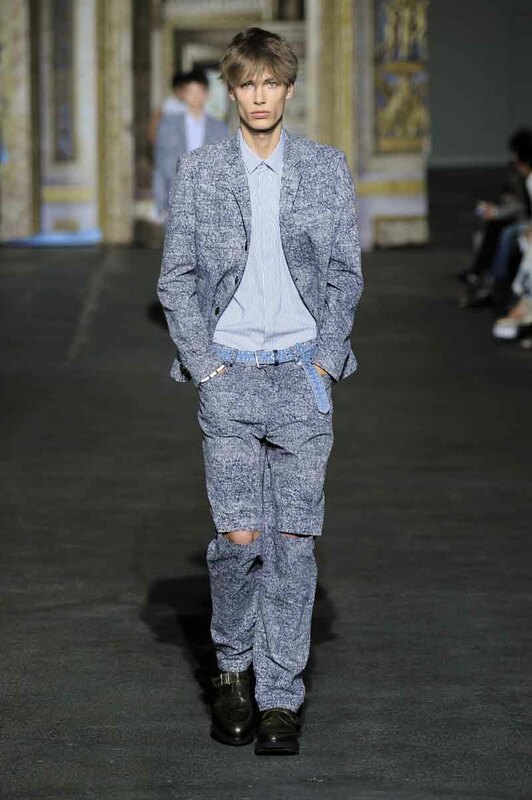 PARIS, Jun 27, 2014/ — With the title “ILLUSION”, Kris Van Assche presented his 20th eponymous collection. And as he explored the idea of “illusion” to the fullest, he also played on his signature “hybrid” silhouettes. Exploring the youthful codes of rebellion in clothing, Kris Van Assche transposed and transformed their meanings and showing them in the process of growth and change in a collection about youthful rites of passage. Here, jeans are not jeans; instead discharge printed cotton jackets, trousers and shorts, mimic snow washed denim styles – complete with carefully slashed knees –combined with crisp tailoring. The MA1 nylon bomber mutates into longer line jackets and parkas, its classic code of khaki and bright orange becoming key colours for the collection as a whole alongside that of military blue. Winter knits are made summer in blown up Fair Isle patterns and feather light weights and textures. The aspirational equestrian motif is made child-like and cartoony, playfully repeated in all over patterns. While signature wool mohair tailoring reflects the theme of the collection in ‘tarnished gilt’ colouring. Characteristic layered styling, mixing the casual and formal and showing the stratified nature of the codes of masculine clothing runs throughout: A leather take on pool slider shoes can be worn with an oversized parka; beaded ‘surfer’ necklaces and bracelets are conspicuously adorned; a denim print jacket can be placed over a formal suit. A mix and match attitude to all is embraced and experimented with. The late eighties and early nineties classics and clichés of youth culture are reflected and remixed in the collection, a time of gilded youth but not necessarily one of nostalgia. Instead, for the twentieth Kris Van Assche show and collection, there is a looking back twenty years to look forward optimistically to the next twenty.